Collectors frequently sell old Sinclair products on eBay.co.uk. Click the "GO" button on the left to find any Z88s being auctioned. 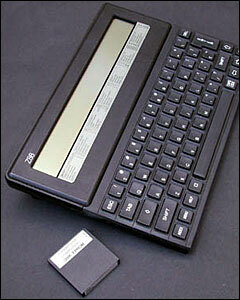 The Z88 was a laptop-style machine with a Zilog Z80 processor, LCD screen screen and a silent keyboard (rubber, naturally). 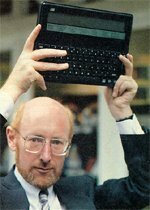 It was the first and only product of Cambridge Computer, the company established by Sir Clive Sinclair following the 1986 takeover by Amstrad of Sinclair Research's computer business. In comparison to the huge sales of the earlier Sinclair computers, the Z88 was only modestly successful. It possibly suffered from being ahead of its time - it was in many respects a forerunner of the personal digital assistants (PDAs) which were to become so popular in the late 1990s. The built-in software suite was very much reminiscent of a modern PDA: calculator, calendar, clock, diary, terminal emulator, spreadsheet and word processor. It was not PC-compatible but, surprisingly, it had a good deal of compatibility with the BBC Micro, thanks to its use of an adaptation of BBC BASIC.